On October 6, 2017, Davin Buffington delivered her son, Colt, via emergency C-section, eight weeks before his due date. Weighing in at just 3 pounds and 15 ounces, Colt and his mom would face several frightening challenges over the following months. Thankfully, the Buffington family received invaluable help from the Angel Fund, NicView cameras, and Gift of Life Housing, providing comfort during this distressing time. Colt spent 47 days in the Benefis Neonatal Intensive Care Unit (NICU) so he could receive expert care as he suffered through apnea episodes and digestive issues. 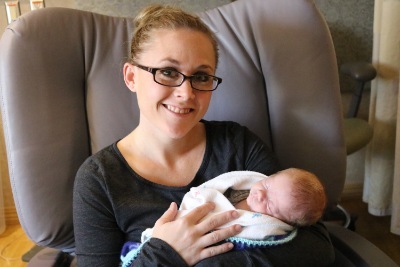 After giving birth, Davin spent five days in the hospital receiving treatment for pre-eclampsia and HELLP syndrome. She was readmitted to the hospital several times due to gallstones and was diagnosed with antiphospholipid syndrome, which was causing blood clots in her kidney and spleen. During this time, she was separated from Colt in the NICU, which made a painful experience even worse. When Davin’s husband Casey returned to work, he was able to feel closer to Colt thanks to the NicView camera. They were also grateful to give their out-of-town family members access to the NicView camera so they could virtually meet the new baby. Staying at Benefis, an hour-and-a-half away from their home near Ledger, was hard on the entire family including Colt’s older siblings, Jaxon and Cashlyn. The Buffington family felt blessed to have the opportunity to stay at Gift of Life while Colt was in the NICU. Once Colt was discharged, only three days passed before they were back in the Benefis Emergency Department. Colt was experiencing severe health problems and was flown to Spokane to receive more advanced treatment for what was suspected to be Hirschsprung’s Disease. Fortunately, it was a treatable milk protein allergy. They were supported by the Angel Fund, which helped cover costs from flights and lodging. We need your help—it costs over $4,600 each year to service and support the NicView cameras, and 14 more cameras are still needed to equip each NICU room. Please click here to donate to the Benefis NICU fund online.